There's always the time to call a U-Turn in my life one way or another. I could now talk about some instances of how I usually contradict my usual (or default) preferences. Here's a list of those crazy instances when my preferences contradict my usual preferences with Japanese culture. I usually prefer Chinese food and Korean food over Japanese food (but I love all three) but I prefer Japanese noodles over Chinese noodles and Korean noodles. It's been suggested that noodles was a Chinese invention that got modified overtime in many countries. While I enjoy Chinese beef noodles but I really like ramen over Chinese or Korean noodles. I like eating all varieties of noodles but ramen happens to be my favorite. 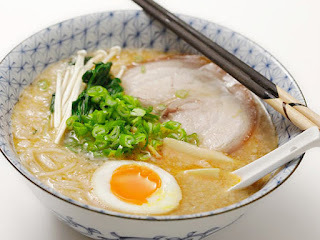 My favorite Japanese ramen is Tonkotsu. While I'm not such a big fan of Japanese cuisine but I still prefer ramen over other types of noodle soups. I like sushi and I enjoy eating it. 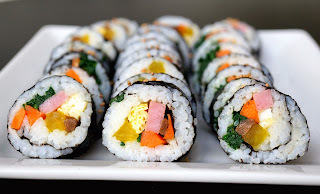 While eating sushi I usually find myself thinking that kimbap tastes better because it's more flavorful. I could go ahead and acknowledge that without the Japanese Manga and Anime then the Taiwanized or Koreanized version can't exist. I like them all but I usually choose the Taiwanized version of the stories based on Japanese Manga and Anime. I guess it's a creative localization without the use of any spliced footage or borrowed costumes. There are times I think the Manga and Anime did better but I think the Taiwanization or Koreanization of these stories tend to create a better charm for me. At the same time I prefer Taiwanese drama over Japanese drama. In general, I usually prefer live shows which is I'd watch Tokusatsu over Anime anytime. I find this a bit of a contradiction. I usually feel comfortable watching 80s to 90s Tokusatsu as the "better era" though there are new school entries that do better. On the other hand, I tend to think that old school Kamen Rider (Showa era) isn't as good as the Heisei era. No matter how there are occasional weaker entries of the Heisei era but I'd still watch more of the Heisei era of Kamen Rider over majority of the old school Showa Rider era. I'd still rewatch Kamen Rider Faiz, Kamen Rider Decade or Kamen Rider Ghost over most old school Kamen Rider. On the other hand, I usually find last decade's Super Sentai as well as the 80s to 90s to be better. It's just pretty weird why I'm enjoying old school for one genre and new school for another. My defense? Well I feel like most old school Kamen Rider aren't as good with their plot writing while most old school Super Sentai tend to have better writing. I listen more to old school Showa era Kamen Rider songs than new school Kamen Rider songs. 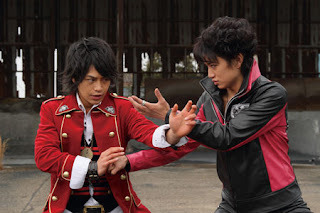 But when it comes to the shows I prefer new school Kamen Rider when it comes to my viewing pleasure. Music isn't always everything isn't it? It's no secret that I don't really consider myself a Power Rangers fan. If I had to choose between Mighty Morphin' Power Rangers or its source material Kyoryu Sentai Zyuranger you know I'd choose the latter. Watching MMPR gets painful not because it's American but because of Jason David Frank who I've grown to despise for some time. The contradiction still kicks in that no matter how much I like Zyuranger over Mighty Morphin' that I still like Kimberly over Mei. But again, I think I still like Rin over Kimberly. It's no secret I usually prefer Super Sentai girls over Power Rangers girls both for shallow reasons and well plot reasons. I usually choose to watch Japanese shows over American shows since most of them tend to have better writing quality. I also watch Japanese shows because of an attractive leading lady but a good story is always more important. Eye candy is just bonus. I admit that there are times I watch American shows because of an attractive lead but I end up enjoying East Asian shows even when there's no attractive lady to lust after. Content counts more in the end, doesn't it? I usually don't like Korean girls that much except for a few exceptions. I still prefer Esther Liu over Song Hye Kyo. 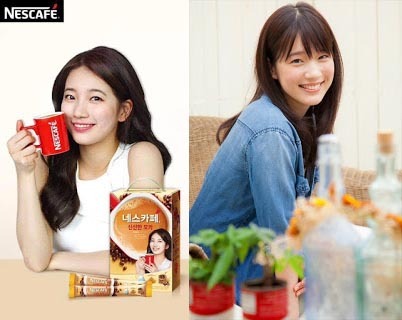 It was a different scenario for me with Maaya Uchida and her Korean lookalike Suzy Bae. This is even funnier considering that I prefer Japanese entertainment over Korean entertainment. Should I mention I like Suzy Bae's voice over Maaya Uchida's voice?